Misfit, the company behind the popular Flash activity monitor, has just introduced a new fitness product called the Misfit Link. 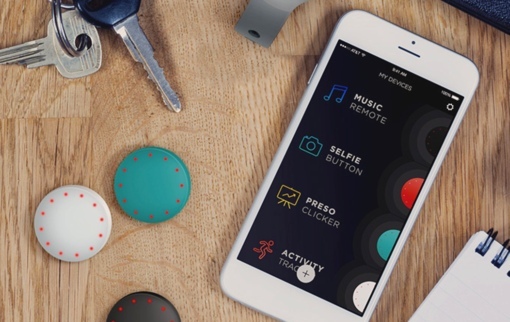 It’s a waterproof exercise- and sleep-tracking device that also doubles as a multi-use smart button. And it does it all at a killer price – just $19.99. The Misfit Flash Link, a small circular exercise monitor that measures approximately 1 inch in diameter, attaches to your body using an included clasp. (A sport band and other mount accessories are also available.) The Link syncs to your smartphone via Bluetooth Low Energy to track calories burned, steps taken, distance traveled and sleep quality when worn at night. It can also interpret and track a wide variety of fitness activities, from cycling to swimming to tennis to yoga. The Flash Link now includes a new, added feature: The Flash Link Smart Button. You can use the Link app (iOS only, for now) to associate the button press with a number of different phone functions: taking a selfie, controlling music, changing your home’s temperature via a Nest learning thermostat and plenty more. It’s an incredibly versatile device. Best of all, the Misfit Flash Link is priced lower than just about any other activity tracker currently on the market. It’s available in your choice of four colors – Onyx, Frost, Reef and Red – on the Misfit website for just $19.99 each. The Misfit Flash device, meanwhile, comes with a sports band in a wider range of colors and is now available for the reduced price of $29.99. I purchased this because it was supposed to be good for swimming. I didn’t find it to be accurate for swimming and couldn’t get it to work as advertised and then the back must have become unsealed because it got wet and died after 6 weeks. Also the holders for this are incredibly cheap and I broke about 5 during the 6 weeks I had it.